Sunday 14 February was the first Sunday of Lent. Lent is a time we stop and reflect on how we live our lives, treat others and what we give to others. 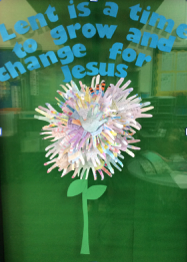 Lent is a time to grow and change for Jesus In Year 4, we have been discussing the importance of Lent and how we can grow and change throughout this time. We made a Lenten promise, choosing something we can give up but also something kind we can do for others. Please contact the office if you have changed any of your contact information. If your child had their 4 year old immunisation in 2015, please provide a copy to the office. School Banking is every Wednesday. The Corpus Christi Play and Learn program is mainly targeting 2,3 and 4 year olds who have not yet begun Kindergarten, but if you have younger children or babies of course they are welcome. This is an opportunity for young children to begin to develop their confidence and curiosity as learners prior to commencing Kindergarten in a safe and secure environment with their parents/carers beside them. Play and Learn is held in Ballygriffin House, and run by Mrs Lisa Cooper. We are opening our "Junkyard" in Area 1 Shortly and we are looking for donated materials for the children to build, stack, roll and create with. Things like wood blocks, hand sized stones and rocks, piping, old plastic or wooden crates, wooden poles etc are what we need. Any nail-free and non-sharp items can be dropped in the bottom carpark near the music room/workshop after school only please (so we can quickly check them over) and then we will be using them as soon as possible. 2016 Fee & Levy Payment Arrangement Forms were issued on Thursday 4 February and are now overdue. If you have not returned this form could you please do so immediately. Copies are available to download from the website. FEE AND LEVY ANNUAL INVOICES will be issued on Thursday, 3 March 2016. After a substantial review of our uniform shop and canteen processes, we are pleased to advise that we have introduced a new smartphone App for purchasing uniform and canteen items. This App is available now. The App is called Qkr! (pronounced Quicker) by Mastercard. Canteen ordering via Qkr has been a huge success with many families embracing the new system. The feedback has been terrific with most comments being how quick and easy it is to use. Can you please ensure that you have updated your childrens name to this years class and remind your children if you have placed a Qkr order on the Friday morning. Canteen Orders – Paper bags are not required when you order using the Qkr App. The Canteen will be open only to Kinders to Grade 2 on Friday 26 February due to Swimming Carnival. The Canteen will be closed on Friday 11 March due to the Walkathon. Countdown: 16 days until the fair! Below is some important information to read before the fair. Our School Fair is only 2.5 weeks away! We are getting very excited and are right into the busy phase of the organisation, making sure that everything is in place and ready for the 4 March. The next meeting of the P&F will be the AGM – Monday 7 March at 7:00pm in the Library. There is a position vacant on the P&F Executive. Nominations must be lodged at the Office by 3:00pm on Friday 4 March. An Administration Officer (part time, casual, 6 hours per week with possible extension) is required to provide administrative and general office support to the Parish Priest.